The human perception of the three-dimensional world is influenced by the mutual integration of physiological and psychological depth cues, whose complexity is still an unresolved issue per se. 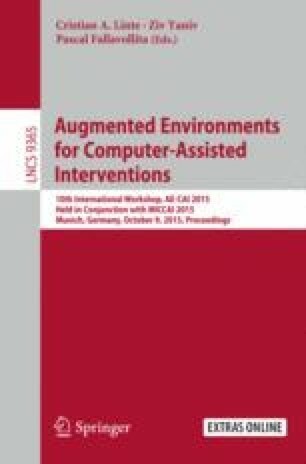 Even more so if we wish to mimic the perceptive efficiency of the human visual system within augmented reality (AR) based surgical navigation systems. In this work we present a novel and ergonomic AR interaction paradigm that aids the manual placement of a non-tracked rigid body in space by manually minimizing the reprojection residuals between a set of corresponding virtual and real feature points. Our paradigm draws its inspiration from the general problem of estimating camera pose from a set of n-correspondences, i.e. perspective-n-point problem. In a recent work, positive results were achieved in terms of geometric error by applying the proposed strategy on the validation of a wearable AR system to aid manual maxillary repositioning. This work was funded by the Italian Ministry of Health grant SThARS (Surgical training in identification and isolation of deformable tubular structures with hybrid Augmented Reality Simulation, 6/11/2014–5/11/2017). Grant “Ricerca finalizzata e Giovani Ricercatori 2011–2012” Young Researchers – Italian Ministry of Health.